Mother Earth is a motherboard. The 'last mile' is much discussed, but much more important is the 'middle mile' – and that means deep ocean cables. A whopping 99% of international data is transmitted along the bottom of the ocean via submarine communications cables, with new, high-cost and high-tech projects planned to further boost global broadband speeds. "Submarine cables are critical to supporting the internet, carrying virtually all traffic back and forth across the world," says Kaveh Ranjbar, Chief Information Officer, RIPE NCC, one of five Regional Internet Registries (RIRs). "Their importance means that there are a lot of them, which in turn means the internet has redundancies in place in the event one section does get damaged," he says. Can a submarine cable be damaged by earthquakes and volcanoes? Earthquakes and natural disasters are rare, but deadly. "When we had the tsunami in Japan in 2011 it destroyed nearly all of the cables in the area," says Jean-Luc Vuillemin, Senior Vice-President, International Backbones & Networks at Orange Marine. Five years previously, an earthquake severed 80% of the cable connections between Taiwan and the world, wiping out half of Hong Kong's internet capacity and leaving its banks floundering. However, the biggest problem is with ships' anchors and the fishing industry. "The problem isn't at all with sharks, as I read in some newspapers, but fishing trawlers, especially near the coast," says Vuillemin, "so we bury the marine cables up to 3m in the seabed, especially near the coast." All this is why the network now has so much redundancy. "A cable break is problematic as a minimum of two to three weeks is required before it will be functioning again," says Eric Loos, Senior Product Manager Capacity & IP, BICS, whose 75 submarine cables have 200 landing points. How do these huge projects get off the ground? The process goes something like this – a global consortium proposes a new high-speed cable to link two disparate countries, and invites investment from global capital and any country along the way that wants to benefit. National governments, telecoms companies or private investors then contribute to the construction of the cable, and pay for a landing station to connect to it. Take Orange Marine's Sea-Me-We 5, a 20,000km-long cable that will link France and Singapore from 2016, with 18 cable landing points in 17 countries including Myanmar, Bangladesh and Sri Lanka. For a developing country, a new cable passing nearby is a huge – and hugely expensive – opportunity. For instance, the Bangladeshi government has taken a loan of $44 million (around £29.5 million, AU$56.6 million) from the Islamic Development Bank to help pay its total contribution of $72.5 million (around £48.7 million, AU$93.3 million) towards the SMW5 cable. 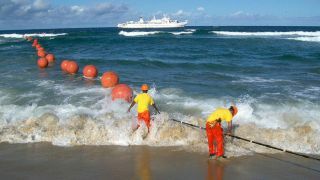 Of the total, $40 million (around £26.9 million, AU$51.4 million) is for the deep-sea cable's manufacture and installation, and $32.5 million (around £21.8 million, AU$41.8 million) is for the branch cable and landing station. Neighbouring Myanmar's decision to also link to SMW5 made it cheaper for Bangladesh to join to it. The stakes are high – Bangladesh's current internet bandwidth total is around 200Gbps thanks to the sole submarine cable it links to, though it also has overland links to Indian cables. By the time SMW5 is completed, the country will have seven times more capacity. "Landing stations can be open or closed," says Vuillemin. "If it's open, all telecom operators can connect to the cable, but if it's closed, only the operator that has paid for the landing station can connect." The cable is being manufactured at one end by Alcatel-Lucent and from the Singapore end by NEC, and laid using one of Orange Maritime's four cable-laying ships. "Fast web access can have transformative powers on developing communities, especially when you think of it in terms of access to education, and better communications during disaster scenarios," says Liam Fisher at Builtvisible. Are new links being made? Rather incredibly, there's a new project called Arctic Fibre whose 15,000km will pass through the frozen North West Passage – the Canadian and Alaskan Arctic – to directly connect Tokyo with New York and London. "Arctic Fibre is a novel and ambitious project that, if successful, would potentially achieve the fastest internet route between New York City and Tokyo, as well as providing high speed internet to cities in northern Canada and Alaska," says Doug Madory, director of Internet analysis at Dyn, whose blog contains some fascinating investigations into Cuba's lack of submarine cables and on Russia secretly activating the Crimean cable. "The Arctic Fibre team is having to contend with issues that have never before been faced by a submarine cable installation project – it's another example of the amazing work engineers are doing out there to create a more resilient and performant internet."